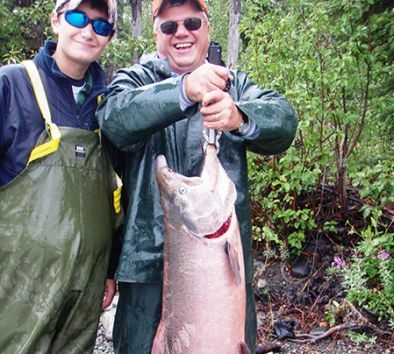 Enjoy a full day of fishing for famous Alaska salmon. This is world-class fishing for King and/or red salmon in the pristine rivers of the Copper Valley. Float the scenic tributaries of the famous Copper River and fish from the riverbanks under the watchful eye of professional fishing guides. Minimum age is 5. Maximum weight is 300 lbs. Fishing licenses are required for anyone 16 years of age or older. Licenses are available for purchase at the lodge upon arrival night. A King Salmon stamp will be required during King season at an additional charge. Tour is not suitable for pregnant women. Dress in warm layers. Bring your sunglasses, hat and camera. This tour accommodates both novice and experienced anglers. You will be fishing from shore and footing is uneven and can be slippery. You must be able to hike short distances over uneven terrain. King Salmon run from June through early August. Sockeye can also be found in both rivers late June through August. For an additional charge, your fish can be processed, frozen and shipped. Due to changing fishing conditions, tour departure times may be changed at tour operator’s discretion.